Received an alert today for just simple issue. i.e., Low Disk Space on System Drive. As usual, I was trying to go to disk properties and use Disk Clean Up utility, but didn’t find out the same in Volume Properties as the OS was Windows Server 2008 R2. With little bit of googling, I found an article from MS website. Disk Cleanup/Clean Manager (cleanmgr.exe) is not appeared by default in Volume Properties. Need to follow few steps as below to clean up the volume. 1. Cleanmgr.exe should go in %systemroot%\System32. 2. 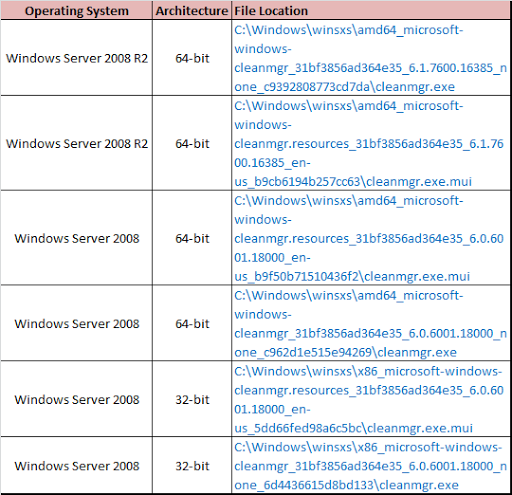 Cleanmgr.exe.mui should go in %systemroot%\System32\en-US. 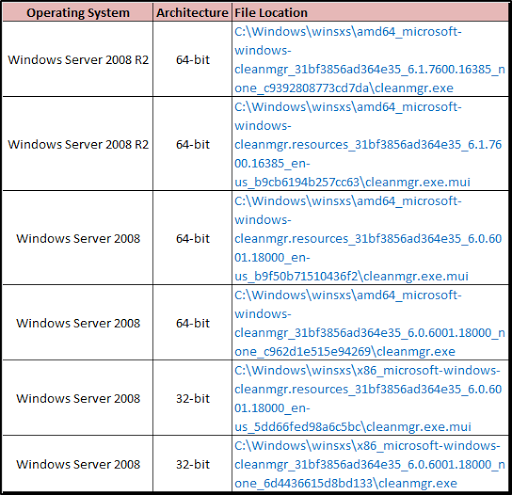 · You can now launch the Disk cleanup tool by running Cleanmgr.exe from the command prompt. by clicking Start and typing Cleanmgr into the Search bar.